The latest survey finds that do-it-yourselfers want access to top tools, human advisors and clear information on fees. Self-directed investors want to do more than “go it alone” when it comes to achieving their financial goals, the J.D. 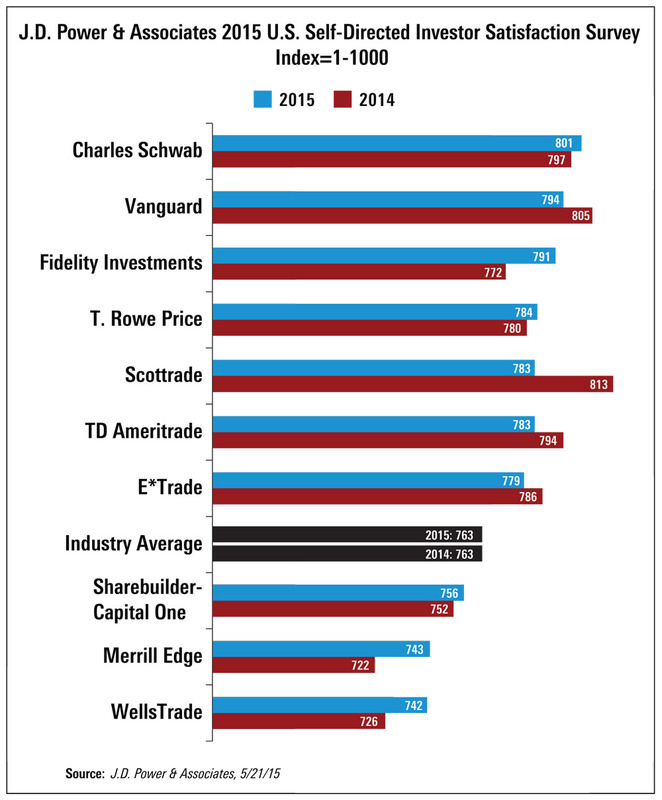 Power 2015 U.S. Self-Directed Investor Satisfaction Study finds. “Self-directed investors may not be looking to delegate managing their money to an advisor, but they do value access to guidance when they are ready for it, whether that means a financial-planning tool they can use on their tablet, a webinar about saving for their children’s education or an actual human being who serves as a sounding board for ideas by phone or in a local branch,” said Mike Foy, director of the wealth management practice at J.D. Power, in a statement. The study, now in its 14th year and released in late May, includes the views of 3,700 self-directed investors and measures satisfaction with their investment firm based on six factors: interaction, account information, trading charges and fees, account offerings, information resources and problem resolution. The current overall satisfaction level across marketplace is 763 (on a 1,000-point scale), which is unchanged from 2014 and up slightly from 752 in 2013. Most investors with guidance-based relationships, 64%, are likely to recommend their firm to friends and family, and many, 45%, are poised to increase their investment levels with the firm vs. those who do not have this type of relationship, of whom just 26% are likely to make referrals and only 29% plan to boost investments, J.D. Power explains in a press release. The 2015 survey finds that consumers are more satisfied with three of the top seven firms then they were a year ago and less satisfied with the remaining four. Of the 10 firms highlighted in the poll, satisfaction increased for six firms and dropped for four. The J.D. Power survey also shows that overall satisfaction is higher among self-directed investors who have a guidance-based relationship (and had an average satisfaction level of 828) than among those who do not (656). Looking at what most impacts satisfaction, providing digital tools for asset allocation, financial planning, and tracking/monitoring portfolio performance seems most critical. Investment firms have room for improvement when it comes to transparency: Just 40% of investors state that they fully understand the fees they pay. Furthermore, investors who receive a clear explanation of fees are more than three times more likely to say they completely understand the fees vs. those who did not receive such an explanation (50% vs. 16%). As for investment style, two-thirds, or 66%, of self-directed investors describe themselves as true do-it-yourselfers, while slightly more than one-fifth, 21%, consider themselves “validators” who prefer to have a professional act as a sounding board for their ideas. The remaining 13% consider themselves “collaborators” who tend to make decisions collectively with help from some sort of advisor. The number of validators and collaborators is higher among Gen Y and Gen Z (38%) and female investors (38%) than among their older, male counterparts, according to J.D. Power.